This will save users a few clicks; however Safari forces input validation on the client-side when you do that. 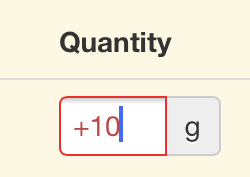 Meaning if you wanted a numeric keyboard by default while allowing other characters, you input will fail. Not only is it highlighted in red, this.value also returns null as opposed to what is clearly in the field, rendering it unusable. That’s right, after iOS pulled the right keyboard, we change the field type to “text”. Note that the client will still display some red around the field as it will perform the validation but at least this.value will return what’s in the friggin’ field. Note 1: the setTimeout is necessary, if we perform the change immediately onFocus, safari pulls the text keyboard. Note 2: the that=this indirection is necessary to save a reference of the object to the context of setTimeout.